With JTAG-Overseer® StarTest introduces a cost efficient JTAG HW\SW tools allowing to remote monitor and test the circuit boards in the multi-board systems such as telecom stations, routers, mainframe computers, etc. The JTAG-Overseer® gives the field service engineer a full control over the logical states of I/O pins or registers that are accessible via JTAG at a fraction of the cost of high-end JTAG tools. 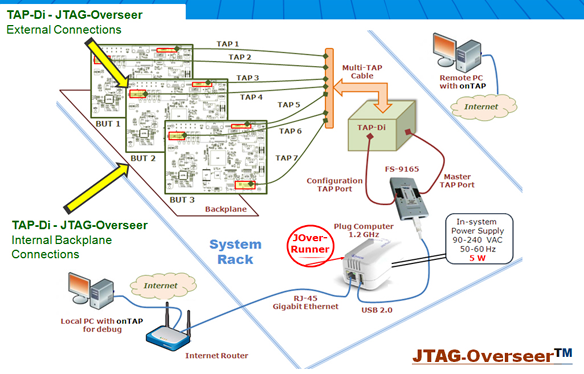 The JTAG-Overseer® enables data center operators to efficiently monitor the entire system and maximize system resource utilization. The JTAG-Overseer® is bridging the gap between network servers, local JTAG applications and system elements. There is neither multi-drop (JTAG system bus) or master-slave architectures used in this product, nor special requirements to the system motherboard (backplane) are assumed. The JTAG-Overseer® is always master and based on the StarTest's TAP-DiОј/a>, block all system circuits boards are always slaves. The JTAG-Overseer® offers users high performance, always on, always connected, and environmentally friendly computing. JTAG-Overseer® HW is eco-friendly because it consumes very little energy (power consumption is 2.3 W idle, no attached devices, 7.0 W running at 100% CPU utilization) but delivers outstanding results without fans or other cooling apparatus native to a regular computer and server construction. 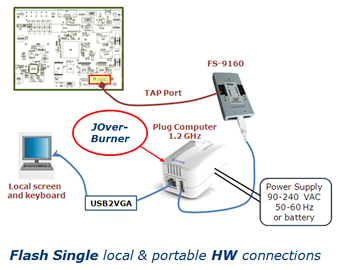 The JTAG-Overseer® SW that named JOver-Runner® is using in the following two global SW modes: JOver-SAMPLE® \ JOver-EXTEST® and JOver-BURNER®. The JOver-SAMPLE® mode is intended for the in-system remote usage to collect the system related failure data with the non-invasive JTAG instructions (Sample/Preload, Bypass, Idcode) only, when the system is in the mission mode. The JOver-SAMPLE® is based on the JOver-Runner® software usage in the SAMPLE mode. The JOver-EXTEST® is intended for the in-system local test usage (as the current onTAP Runner) when the system or any part (circuit boards or assemblies) are not functional. The JOver-EXTEST® is based on the JOver-Runner® software usage in the EXTEST mode. The future JOver-EXTEST® releases will be compatible with any JTAG vendor platform (Flynn onTAP, Asset, Corelis, JTAG Tech, Gopel, etc.) by including the software translators from any vendor platform executive format to the onTAP-based SVF format (possibly without diagnostic possibilities in the common case). 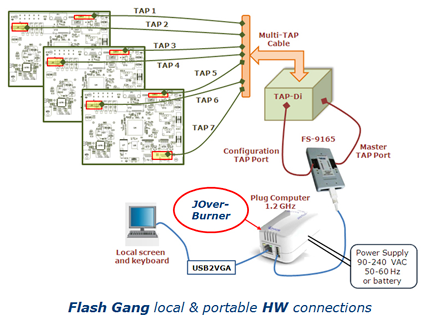 The JOver-BURNER® mode is intended for two Flash programming: Gang and Single, both might be Single and Portable.